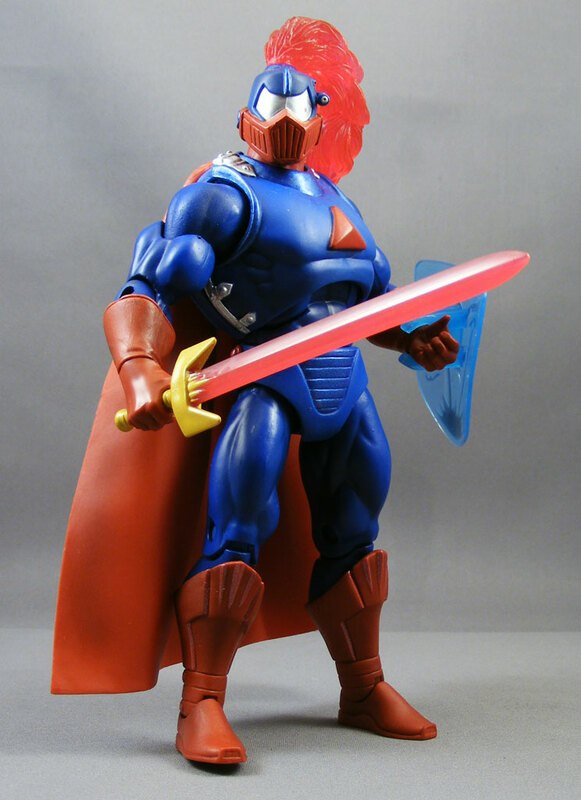 Sir Laser Lot is the latest addition to the Masters of the Universe 30th Anniversary subscription. The character was created and designed by comic book writer Geoff Johns, who successfully revamped DC’s Green Lantern line of comics earlier in the decade and is currently shaping the development of the New 52. I once interviewed Johns for PGPoA, which you can read here. 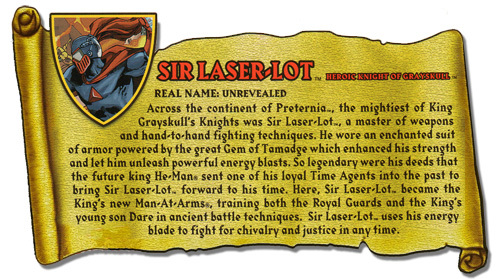 Sir Laser-Lot has also played a role in the new comics produced separately by Mattel (as minicomics packaged with toys) and DC’s MOTU comic. Like the Mighty Spector, Sir Laser-Lot was controversial when revealed. Why? Let’s find out. What I think we’re getting with Sir Laser-Lot is a figure that’s clearly designed as it if had an antecedent in the 1980s. That vintage figure would obviously have had some sort of light-up gimmick; perhaps a solid right arm with a light to light up the sword (a la Laser Power He-Man) and a light in the chest (a la Blackstar) to make the “Gem of Tamadge” glow. The fact that the gem is just painted red, despite being talked up in the bio and the new comics, seems odd – making it translucent seems like a no-brainer. In terms of sculpting, I think the Four Horsemen did their usual fine job. It’s a fairly simple sculpt, with a lot of re-use except for the head and armor. The “laser” bit on the side of the head looks incongruous but it’s a nice touch. Plastic & Paint: The obvious problem with this figure’s look is all the blue. The lack of differentiation between the chest, torso, pelvis, and limbs makes the figure look dully monochromatic. (This is why superheroes often look better with colored briefs or big, bright symbols on their chests.) Just breaking up all the blue by having the armor be, for example, metallic blue would have gone a long way to improving the figure’s look. And why not push the whole “laser” thing even further? Why not mold the cape in translucent plastic, like Scareglow? 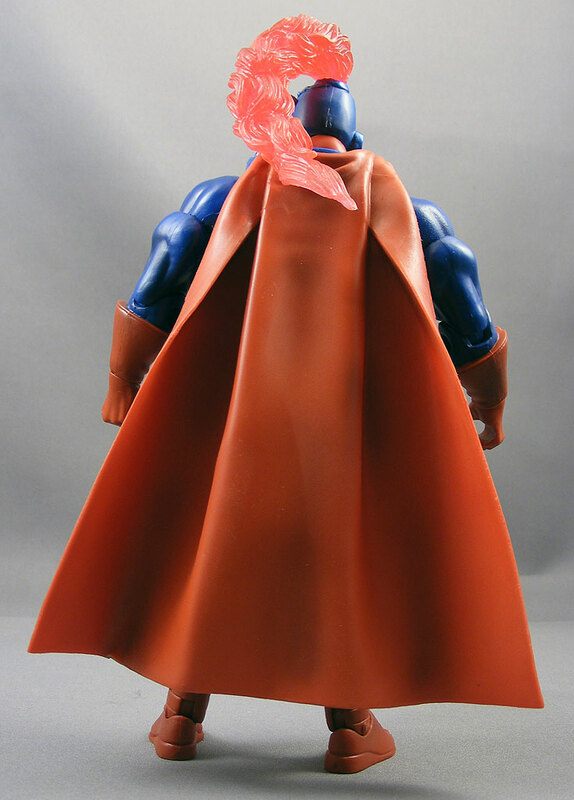 Incidentally, the cape is heavy enough that it makes standing the figure in certain poses a bit difficult. Like Spikor, Sir Laser-Lot appears to have limbs molded in black and then painted a solid color. It’s probably worth discussing whether this painting-on-black-plastic trend is good or bad. Many collectors seem to be viewing it as a bad one, a sign Mattel is going cheap, though some argue it’s more expensive to paint something than mold it in that color. I confess I don’t know. But isn’t this how companies like NECA do it – mold it in one color then apply the paint? Doesn’t this reduce the “toyishness” of the figure? 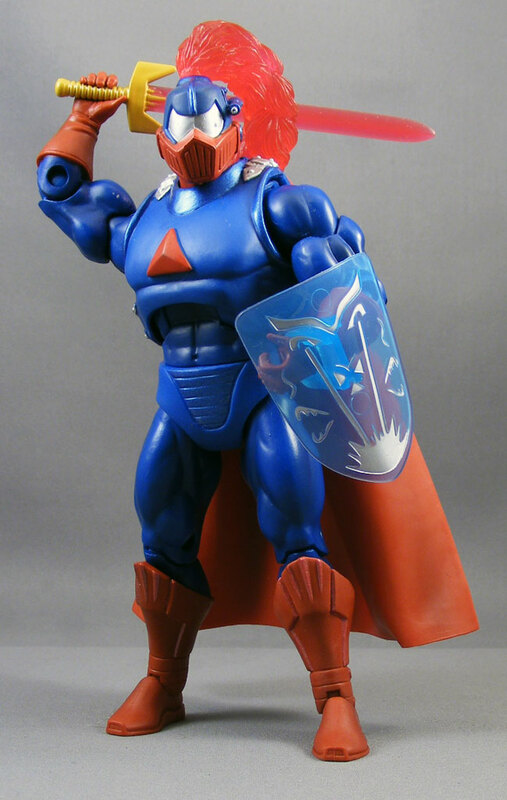 Articulation: Standard for MOTUC. I’m not sure if the plume is supposed to move, but mine didn’t move easily so I wasn’t going to force it. Accessories: Sir Laser-Lot comes with a sword, a mace, and a shield. Both the sword and mace are molded in translucent “lightish-red” plastic that detracts from the “laser” idea and makes them look more like candy. The sculpt of the mace is a bit odd, with the spikes having small nubs like the triggers on a naval mine. The sword is a pretty straightforward sculpt, though I wonder whether it could be reproduced in silver and yellow as a minicomic Tri-Klops sword. The shield is translucent blue, rather than a matching lightish-red, and has an odd symbol on it of what looks like someone shooting lasers out of their eyes. It’s entirely possible this has been explained in one of the comics; I haven’t gotten to them all yet. Quality Control: I worry about how the painted limbs will look after extended posing, i.e., whether the paint will flake off. But other than that, I didn’t detect any major problems. Overall: I like Geoff Johns as a writer, and some of his designs for new or revamped Green Lantern characters have been fantastic. I’m not certain how much input Johns had into the final design of Sir Laser-Lot (seems like quite a bit), versus to what degree Mattel made changes to save money, but the end result is disappointing. 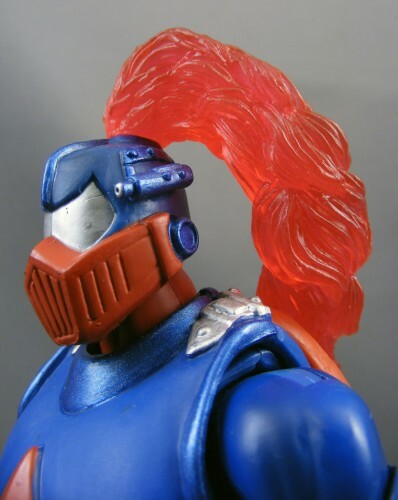 I remain convinced that if Sir Laser-Lot was an update of a vintage figure with some sort of laser gimmick, he’d have strong fan appeal (lots of people want Rio Blast, and he’s arguably more incongruous to Eternia than Sir Laser-Lot). Without a sense of character history or nostalgia, this figure has to stand on its own design. The nonexistent laser gimmick may actually hurt his popularity by emphasizing the science fiction elements of MOTU and detracting from the sword-and-sorcery aspect that seems to appeal more to modern collectors. And personally, I just can’t get past all those swaths of blue. 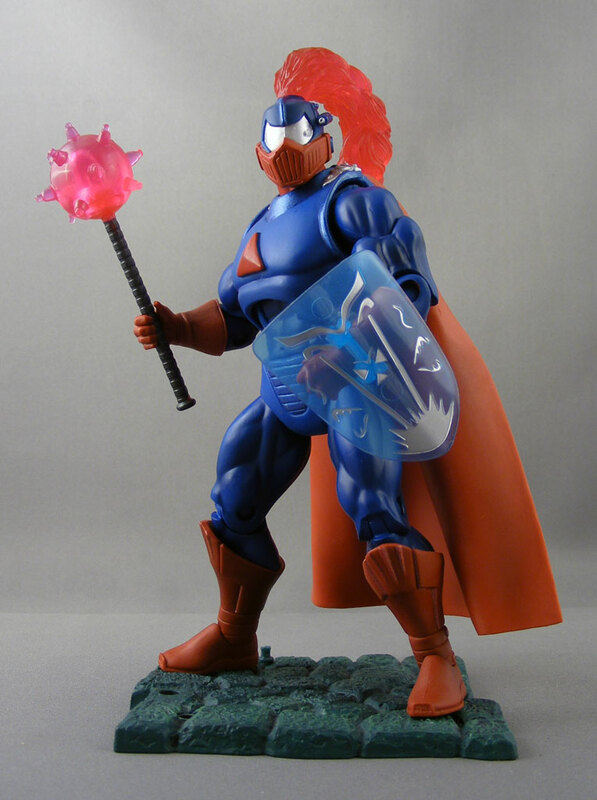 *It’s worth noting MOTU already has an armored knight character: Extendar. I also wonder whether the young Johns was a Rom fan. I think he would look better if his plume wasn’t translucent red. The pic in the bio shows that the plume is the same color as the cape. It’s one of the reasons why I’d replace his head with a spare head from another figure like Bow or Icarius (he can be a twin brother to Icarius obsessed with Pre-Eternia). I can’t really put my finger on it, but there’s something about this guy that just does it for me. His intense primary color scheme really feels ’83-’84 MOTU, & it gives him that Superman feel of “strength & honor” as well. I like him alot, & with the exception of Spector (not because it’s Neitlich’s creation, but rather, ’cause it has, IMHO, serious design flaws), I’m very happy with what the 30th line has offered so far, & stoked with what’s left to come. I can understand liking this figure. Not liking the blue is certainly a matter of opinion. Michael Crawford loved this figure. As a fan of the sword & sorcery aspect of motuc (and knight figures in general), I really, really wanted to like this figure. The problem asolutely lies with the paint. I think it would have looked so much better with a metal/steel color in place of the blue and royal blue in place of the red. Maybe if I ever find one cheap enough to tempt me, I may buy and repaint. I LOATHE Sir-Loser-Lot… I’d say I almost Hate him, but my hate is reserved for Snout Spout. I Absolutely agree on the “laser cape” that would have been so awesome! You’re right that based on Johns’s pitch of the character as a “Galactic Knight” (no relation to Jedi), using the more tech-type limbs like those of Trap Jaw or Roboto would have made more sense. I second Mario’s sentiments about both SLL and the 30th Anniversary figures as a whole. Though his over-all design is relatively simple, I think he looks great–and, to echo Mario, awesomely vintage. Personally, I love the “wall of blue”: it makes his armour look more like a complete suit than if it was broken into components of different colours. I’ve also never been a fan of “trunks,” whether on superheroes or anyone else–the logic or aesthetics of wearing your underwear on the outside (particularly while doing battle) has always been lost on me. Also, as I recall, the Gem wasn’t done in translucent plastic because it would have needed to be tooled separately from the chest armour. Still, I think a slight improvement would have been to paint it with the same metallic red used to highlight his boots. Most of my MOTUCs get a little love after they arrive and then make it to the display shelves pretty quickly. After a week and a half, I’m still dinking around with SLL to find the coolest pose or combination of accessories. (I think the mace is my favourite weapon to come out of the line thus far in 2012.) He’s just too much fun to put down, and for me, that’s kind of a big deal. Despite his many detractors (and the inevitable stream of would’ve/could’ve/should’ves that this line always draws), I call him a WIN. I don’t see why he’s so controversial. Maybe he killed Stratos or something? Wasn’t that Hordak and King Hssss? No, Scott Neitlich. Scott killed them all. Strangled them. i thought the exact same thing poe, about his laser sword, that it looks like a pre-lease of the tri-klops mini-comic sword… so when mini-comics trik was offered in the sub vote thing, i figured for sure he would “win” by hook or by crook… but alas. still, i think he’s a given. just as i think the forearms for vykron are narrow, and looks vaguely 200xish, with the idea of doing a 200x adam. we’ll see, of course. as for the guy’s actual execution, i agree w/ some folks that personally, were i designing a robotic knight out of the existing parts, i would have made choices leaning towards the trap jaw and MEF arms, and the roboto legs, we have kind of bought those an awful lot lately. mattel doesn’t think in terms of part malaise, but we do, and i could see that setting in if he’d have been delivered that way. and while you and i are of one mind on his color scheme, there are folks who like it, and johns does come from a comic book background, where that kind of color scheme is commonplace. that said, that kind of color scheme is decidely NOT motuish. 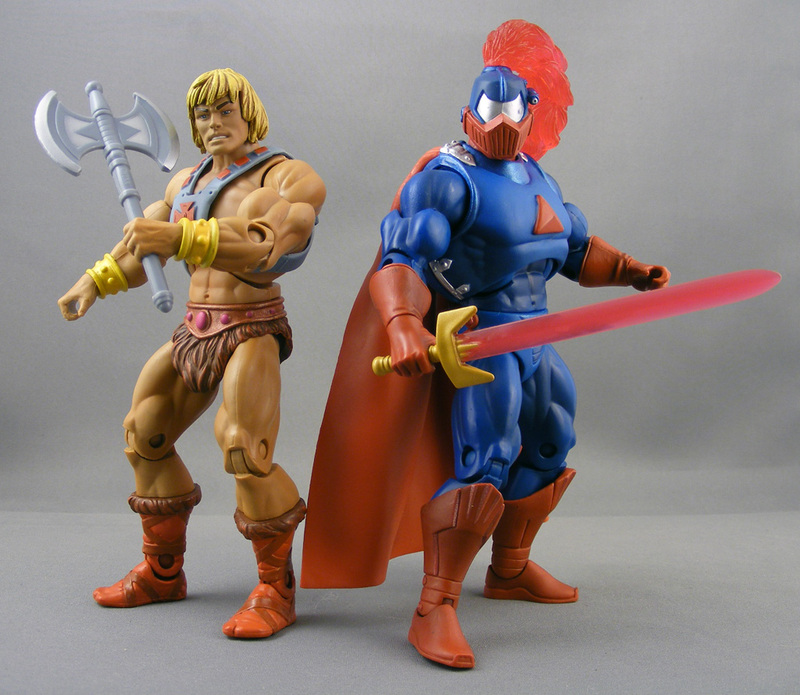 while motu is know to combine some garish colors at times, they break things up better than this. ram man had large swathes of red and green, and even he didn’t look this duochromatic. no one in the vintage line did, even genuinely duochromatic guys like extendar, because they used sculpts details to vary up the paint regions. I’d buy him if he had chrome like metallic colors to indicate he is wearing armor but the plain body is so dull.Also if they patterned him after Captain Lazer,I’d buy him in a heartbeat! The paint job kills this figure. It’s Elseworlds Superman. Could have been so much better.